WHERE DO LEAF CUTTER BEE NEST? Leaf cutter bees are a solitary insect. This means each nest is independent of others. However, it is most common to find several nests in close proximity of one another without conflict. Their territories can be quite extensive – over several acres – depending on local food and shelter. And since there are hundreds of species found throughout the lower 48 states of America, they can vary in color and size. Many look like common honey, bumble and carpenter bees but the one sure clue they’re leaf cutters is when you’re finding solitary nests with plant parts inside. A macro shot of a leaf cutter bee. Leaf cutter bees will overwinter in prepupal and pupal stages. They are among the earliest if not the very first bee to begin pollinating. They are not too sensitive to bad weather and will readily work when most other bees will remain home in the comfort of their colonies. For this reason Leaf cutter bees are highly desirable – except when they’re damaging your plants!! In fact, leaf cutter bees are so desirable many gardeners and farmers actively install LEAF CUTTER BEE HOUSES around their property. Hang them on fence posts or trees and you too can attract them to your land. Nesting bees will work the landscape in and around your property insuring healthy pollination. With Honey Bee populations declining, the installation of these homes can have a big impact on local plants. Furthermore, making leafcutter houses readily available around the yard, they will help reduce nesting activity on your house! As the weather warms, Leaf cutter bees will begin to emerge and immediately start looking for plants to fix old nests or build new ones. Nest sights will be cavities which range from 1 inch to several feet deep. Such cavities can be found anywhere and are generally preferred to be around 9/32 to 5/16 of an inch wide in diameter. Such cavities can be found in old tree stumps, rocks, the ground or even live trees. 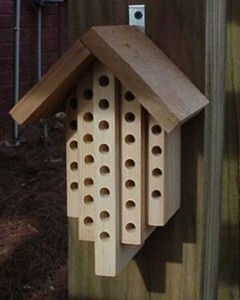 In fact, they will readily take advantage of old mud dauber and paper wasp nests! Once a suitable nest is located, queens will actively search for food – pollen – along with nest sealing material. During this time she will mate so fertile eggs will be produced as the nest is constructed. Nests are constructed by first placing food in the chamber, next laying an egg on the food and lastly by sealing the egg and food with a type of plaster. This plaster is usually made from mud or some cellulose product like paper or old wasp nests. It can also be made from plant parts like leaves (their favorite material to use). Once sealed, the eggs will have all they need to develop and grow and one day they will emerge ready to continue the process. Since nests are dependent on a healthy supply of pollen, expect to have activity during any one growing season. For this reason northern territories may only have one generation active per year but southern regions could have several develop. Leaf cutter bees are generally passive and not very aggressive. However, they can sting and will do so if handled or aggravated. For this reason they are best left alone. However, the opportunity for nest sights on homes is great. This is why this bee can become a major nuisance if nesting is ignored. Furthermore, they can cause damage to both homes and plants which is unsightly and unacceptable. Leaf cutter bees can also create their own nests when none are easily found. They will chew through wood, mortar and stucco and though such chewing is usually not going to hurt the structural integrity of the building, it will certainly be unsightly. Cedar and masonite sided homes are not immune to this behavior and virtually any overhangs will attract them to soffits and fascia boards. Holes in such areas are usually shallow and small but will certainly be both annoying and aggravating. 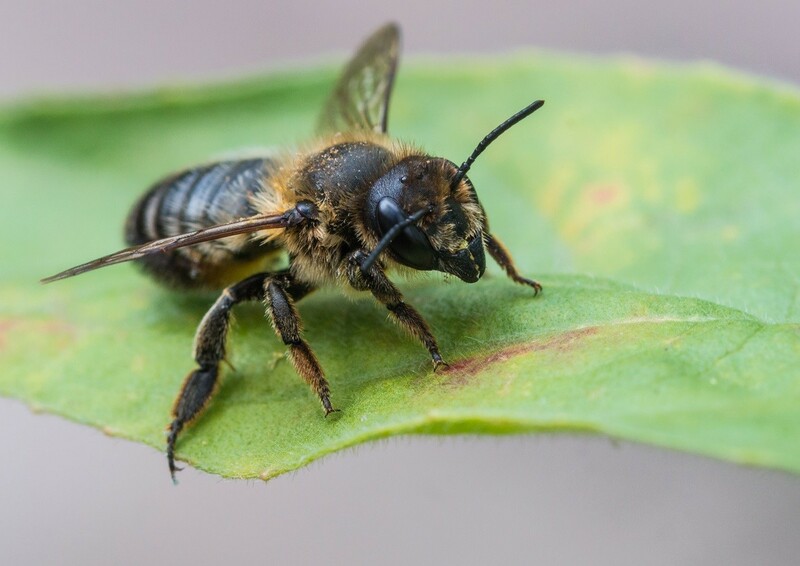 Leaf cutter bees have learned that most any home has an abundant supply of nest locations and taking advantage of them seems to be at an all time high. It appears that once a house has activity it will get more and more every year. This probably happens because if a structure has something unique about it which leaf cutter bees like, female queens will leave special pheromones used to “mark” structures as a good place to live. This means once your home gets “marked”, bees will be coming around looking to nest. Leaf cutter Bee nests on the home can become a problem but the damage they do to the structure is generally superficial. However, in the yard, their damage can be quite real and have major impact on targeted plants. Leaf cutter bee damage is done when they remove leaves from plants by cutting away small circles around the size of a dime. In fact, it is very common for them to find a shrub or plant they find attractive and within a week or two, the plant has no leaves. When such damage happens rapidly, the plant may never recover from it’s loss. Remember, leaves play an important role for any plant. Without them they are not able to create food and eat. And if there are a lot of bees active, certain leaves will begin to suffer huge tissue loss and die; some will fall victim to plant disease or other insects. Plants which are targeted by leaf cutter bees usually have some characteristic or feature they want. For this reason a few sections of leaves removed turns into a few more and soon a lot more. Damage will happen quickly since these bees work around the clock. 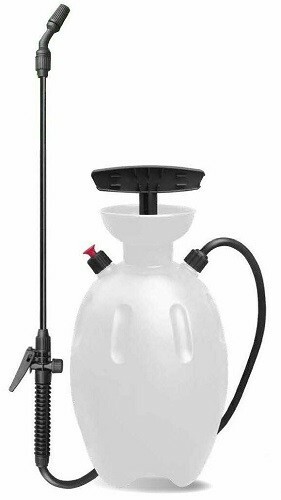 If you find activity that is damaging a prized plant or some fruit or vegetable, we have several concentrates you can apply to either chase them away or kill them. The first is CYPERMETHRIN. 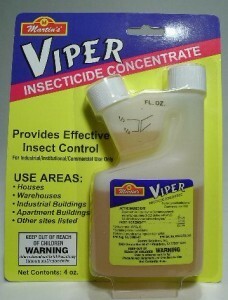 This concentrate mixes with water and is highly repellent to all insects. Bees will readily detect its presence and stay off any plant you spray. Mix 1 oz per gallon of water and treat plants you want to protect in the evening, just before dark. Leaf cutter bees are most active at night so treating right before dark is a good time to get a fresh barrier in place. Within a few days of being treated, local bees will change their foraging habits and begin looking for plants elsewhere. Cypermethrin will last 2-4 weeks so plan on treating ever 2 weeks if they come back. But once gone, once a month should keep them away. If you’re not content just repelling the bees using the Cypermethrin above or the Permethrin below, spray the plants they’re targeting with OPTIGARD. 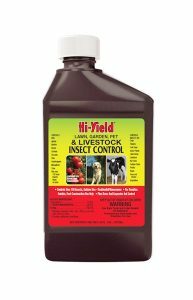 This non-repellent concentrate is commonly used on plants to stop whiteflies and aphids. As a non-repellent, insects won’t notice its present and continue to forage where its been applied. This will cause them to pick up small doses and after 2-3 days, they’ll die. 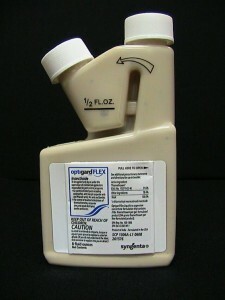 Optigard should be mixed at a rate of .5 oz per gallon of water and should be applied to the leaves they’re targeting. In most cases there is no need to spray the flower of the plant being attacked but if you have budworms or something else eating the new growth, spray it all. But if its just the leaves, a low pressure spray on the leaves will do the job fine. One treatment will usually do the job but if you want to make sure they don’t return, renew the application every 2 months. If you have bees targeting a vegetable bearing plant or fruit producing tree, use GARDEN SAFE PERMETHRIN. This concentrate is similar to Cypermethrin in that it will repel bees from the treated surfaces. Mix 2 oz per gallon of water and plan on treating every 1-2 weeks when bees are active; every 2-4 weeks to make sure they don’t come back. Permethrin is safe enough to use on any vegetable or fruit bearing plant so you can still eat the crop (assuming they can still produce a harvest). When deciding how many plants you should treat, the rule to follow is simple. When a plant starts to experience leave damage due to leaf cutter bees, you need to treat. If you have several plants of the same species, treat all of them. This will be needed because if you treat only one the bees will simply move to the untreated plant since it is the same species. If you only have one plant, you only need to start by treating that plant. Next, watch to see where they move. It is possible they will move to some adjacent plant which is a completely different species altogether or they could move to vegetation which is not even located on your property. Since you cannot be sure there is no need to broadcast your applications. Instead, play a wait and see game to learn just where they appear next and then treat that plant accordingly. Once applications begun, expect to perform followup applications every 2-4 weeks depending on local activity and populations. To apply any of the products above, you’ll need a good PUMP SPRAYER. In most cases, there will be no need to pump it up much as low pressure will prevent wasteful run off unless you need to reach a height of 10 feet or more. Our sprayer can reach over 15 feet for tall shrubs. Leaf cutter nests on the home may not sound like a big deal but they can become a major problem. Such activity usually starts out innocently and then blossoms into a major concern a season or two later. The areas where they nest dictates just what products you should use and how they should be applied. If you have bee nests forming in weep holes or the tubing used for weep holes, it is important to keep these open and clean. Bee nests will quickly clog them and prevent proper water drainage. This blockage could lead to several other problems including water damage, termites and carpenter ants. To stop this from happening, there are two things you need to do. First, try to identify all weep holes around the structure. Next, clean them out making sure to remove all nests and nest components. The best way to do this is with a small drill bit or tiny screw driver. You can use a thin rod like a coat hanger too but many times all this does is push the nest further up the tube. Once you’re sure the holes open, inject PHANTOM AEROSOL using the included application straw. 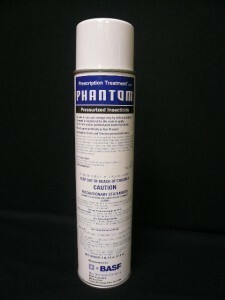 Phantom won’t kill anything quickly. It uses a new type of active known as a non-repellent. Spray into the hole for 5-8 seconds in early evening and do this for 3 evenings in a row. Phantom will take 2-3 days to take affect. As the bees pass over the treatment, they’ll be picking up small amounts of the active which is then carried throughout their nest. Within a few days they’ll die and in theory, the treatment should kill hatching larvae. But to be sure nests don’t form again, treat all holes every month.